The event is becoming the new kickoff to May which we all know is Bike Month. Bells & Whistles to Skylight SoHo. Launches Bike Month NYC and Benefits Transportation Alternatives! best urban bicycle show of its kind ever! March 27, 2012 — New York, NY: It’s all about the bike in New York City on the weekend of April 28 and 29 from 10 a.m. to 7 p.m. at Manhattan Media’s bike-tastic event, The 2012 New Amsterdam Bicycle Show: Benefiting Transportation Alternatives In its second year, this event returns, bigger, better and “bikier” to Soho’s chic and bike-friendly venue, Skylight SoHo, in Manhattan. Just as New York City embraces bicycling, improving the urban landscape with hundreds of miles of bike lanes across the boroughs, this new consumer-focused bicycle show will again feature the many nuances of bicycling—from bikes for commuting to racing, transporting and pleasure rides. T.A. representatives will be on hand this year to provide valet bicycle parking to guests, as well as safe and useful tips for New York City bicyclists. 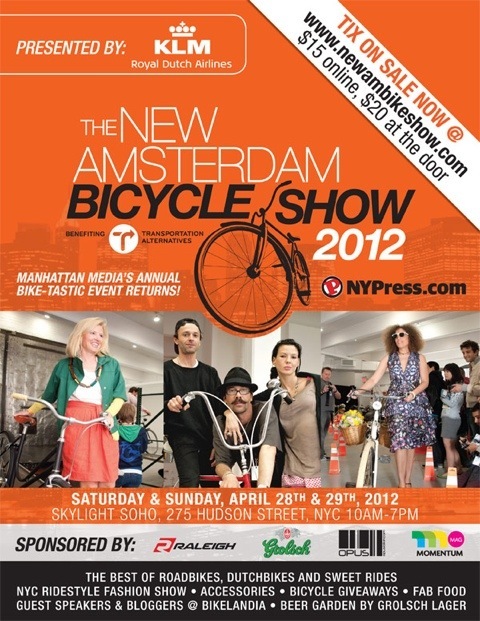 “Nothing showcases New York City’s enthusiasm for bicycling like The New Amsterdam Bicycle Show. With something for everyone, from the newest bicycle commuter to the most experienced racer, this show truly represents the diversity and scope of bicycling in New York and we’re proud to support it,” says Paul Steely White, Executive Director of Transportation Alternatives. KLM Royal Dutch Airlines is this year’s presenting sponsor, KLM has been recognized for its continuous efforts and initiatives to minimize the company’s impact on the environment. These initiatives include fuel-efficiency as well as its commitment to sustainable biofuels development. KLM and the WWF-NL (World Wide Fund for Nature the Netherlands), entered into a groundbreaking partnership aimed at developing sustainable biofuels and cutting CO2 emissions even further to contribute to climate control. Furthermore, Air France KLM has been a sector leader in the Dow Jones Sustainability Index for 7 consecutive years. In addition, Amsterdam, well-known as the bike capital of the world, is home of KLM’s headquarters and its global hub at Schiphol Airport. The award-winning airline will be located at booths #35 and #36 in the main room. Other show sponsors include Raleigh USA, who will be on hand to display their wide range of iconic commuter and road bicycles in booths #37 and #38 and will be giving away a few high-end models at the show; Canadian sponsor Opus Bikes, who will be located in front of Raleigh and KLM in booths #44 and #45; and Vancouver’s stylish Momentum Magazine, a media sponsor and huge inspiration for the show’s spirit, who will tweet and cover the action from booth #34 next to KLM. Bicycling Magazine returns in 2012 to sponsor a seminar portion of the show called BIKELANDIA, that will feature panels, presentations and discussions organized by Transportation Alternatives and Manhattan Media. The show will take place in the deluxe, 18,000-square-foot Skylight SoHo, run by Skylight Group, the country’s premier event space management firm. Skylight SoHo is a dramatic white space with 20-foot ceilings, a series of spectacular skylights and a long, dramatic corridor that will be home to the show’s “Hall of Handbuilts.” Sponsor Grolsch Lager will present a bike-centric biergarten on the 3,000-square-foot terrace, and the 15,000 square feet of interior space will house the world’s most beautiful bicycles and accessories. Skylight SoHo is an unparalleled setting for The 2012 New Amsterdam Bicycle Show and its exhibitors and sponsors. • KLM Royal Dutch Airlines is organizing a Grand Prize raffle of a pair of round-trip economy class tickets from New York to Amsterdam, followed by First Prize, a KLM-branded traditional Dutch bicycle. Show attendees are invited to register for the drawing at the KLM booth, located at booth spaces #35 and #36 in the main hall. In addition, attendees visiting the KLM space will discover an entertaining KLM photo booth that captures great pix which guests can take home or send electronically to friends and family. • Grolsch’s Biergarten. Famous for their Dutch lager, Grolsch Beer will be pouring complimentary pints for two days in their very own beer garden. Setting up shop in the bike-centric back terrace, Grolsch will create their spin on a biergarten under a tent with communal tables and chairs for all. Attendees can relax and enjoy a nice, cold lager while taking in the world of bikes around them. • BIKELANDIA, sponsored by Bicycling Magazine, will feature authors and experts leading presentations and panels. At 3 p.m. on Saturday, April 28th, Bicycling Magazine contributor and Guardian editor Matt Seaton will discuss NYC’s “Bike Lane Backlash” and the critical issue of cyclist behavior, based on his feature in Bicycling’s May issue. New York’s own beloved author/blogger Bike Snob NYC will speak about his new book, The Enlightened Cyclist, at 4 p.m. on Saturday, April 28. Film critic at the Philadelphia Inquirer and author of Hollywood Rides a Bike Steven Rea and Grant Petersen, founder of Rivendell Bike Works and author of Just Ride will also discuss their new books. Ben Fried, the Editor-In-Chief of Streetsblog, will share the inside scoop about how Streetsblog makes an impact through effective advocacy journalism. Clarence Eckerson Jr., founding Director of Streetfilms, will show a selection of videos from Streetfilms’ 450-film collection and share secrets to making NYC a world-class biking city. Other speakers (TBA) from advocacy groups, bicycling publications and bicycle makers will also be in attendance. To read our online updates please visit http://newambikeshow.com/updates. • The “New York Ride Style” fashion show returns and delivers stylish fun and finds from all over the city and globe. 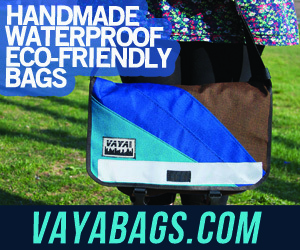 It’s a star-studded event full of spring and summer’s latest bike gear for natty urban cyclists. To purchase tickets, visit: newambikeshow.com. Tickets are $15 in advance online and at select exhibiting bike stores. Tickets are $20 at the door both days of the event. One ticket is good for admission on both days. SECURE BICYCLE PARKING: T.A. representatives will be on hand to provide valet bicycle parking to guests.